Josh Jones is a freelance brass player and instructor from Charlotte, NC. He began playing trombone in the seventh grade, but after several years discovered the euphonium to be his real passion. Josh has been Solo Baritone in the North Carolina Brass Band since 2014. 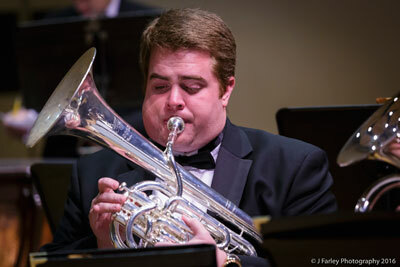 He has also played euphonium with the Queen City Brass Band, Charlotte Concert Band, Carolina Wind Orchestra, Carolinas Wind Symphony, and Western Piedmont Symphony. Josh received his Master’s degree in Euphonium Performance at The University of North Carolina - Greensboro, studying with Dr. Dennis Askew. While at UNCG, he was principal in the wind ensemble for five years, a member of the tuba-euphonium ensemble, and performed numerous solo recitals. In 2008, Josh was a winner of the UNCG Concerto Competition. Josh maintains an active teaching schedule with private lessons and masterclasses in area schools. In his spare time Josh enjoys being with his daughter, Paige, his dog, Gracie, and spending time outdoors.